German Field Marshal Erich von Manstein’s efforts to rescue the Sixth Army at Stalingrad turned into an unimaginable disaster. It was November 24, 1942. Speeding across the snow-covered landscape of eastern Ukraine, the personal command train of German Field Marshal Erich von Manstein was on its way to the southern Russian city of Novocherkassk, where he would take up his new assignment as commander of Army Group Don. Two recent events weighed heavily on Manstein in the quiet moments. Just over a month earlier, Manstein had buried his favorite aide, Lieutenant Pepo Specht, who had died in the crash of a Fieseler Storch light plane. Less than a week later, Manstein’s oldest son Gero was killed in action with the 18th Motorized Infantry Division of Army Group North. Both losses affected him deeply. Manstein was widely considered the tactical genius of the German Army in World War II. As a staff officer in 1940, he created the attack plan that sliced through France in less than two weeks; as a corps commander in 1941, his LVI Motorized Infantry Corps swept through the Baltic States and up to the gates of Leningrad. In July 1942, his Eleventh Army conquered the huge Soviet fortress at Sevastopol. Now, in his first operations as an army group commander, he was about to undertake the most formidable task of his career. But first, a small gathering of Manstein’s staff on the train offered a toast to the field marshal; it was his 55th birthday. On November 19, 1942, the Soviets had unleashed Operation Uranus against Army Group B. They quickly penetrated the Romanian Third Army holding the front on the Don River north of Stalingrad and, on the following day, attacked and penetrated the German Fourth Panzer Army and Romanian Fourth Army holding the front south of Stalingrad. Their aim, which they accomplished in a mere four days, was to cut off and isolate Field Marshal Friedrich von Paulus’s German Sixth Army in Stalingrad; doing so left a massive hole in the German front in southern Russia. Manstein’s mission was to bring the enemy attacks to a halt, rescue Sixth Army, and restore the front between Army Group B to the north and Army Group A to the south. Disaster loomed. 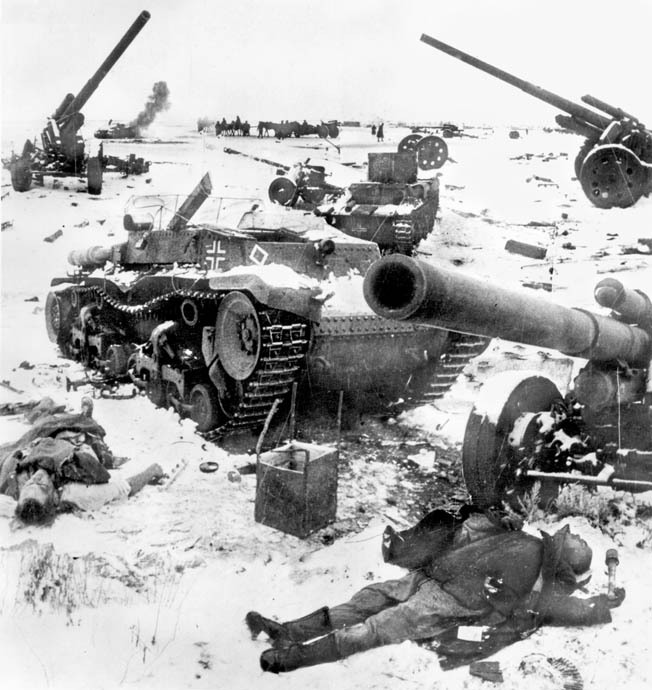 All of Sixth Army and most of Fourth Panzer Army were cut off; five German Corps of 20 divisions, two Romanian Corps of six divisions, plus many independent army artillery and engineering units were surrounded in frozen Stalingrad. Outside the encirclement remained the scattered remnants of several divisions of the Romanian Third Army and various Sixth Army rear area service and supply troops north and west of Stalingrad; only a few scattered remnants of Romanian cavalry units and the Fourth Panzer Army’s 16th Motorized Infantry Division remained south of Stalingrad. Based on Luftwaffe commander Hermann Göring’s assurances of its capability, Hitler had ordered the Luftwaffe to organize an airlift to deliver supplies to the Stalingrad Pocket and told Sixth Army to dig in and await relief. Hitler demanded that Stalingrad be held at all costs due to the prestige factor. Manstein knew, however, that Sixth Army could not remain in Stalingrad as Hitler expected; he thought that he would need it operational in order to stitch the southern front back together. For him, the only questions at this point were how soon a suitable relieving force could be assembled to attack the pocket from the outside, and could the airlift enable the Sixth Army hold out until then? Out on the wind-swept steppe west of Stalingrad the scene was panic and chaos. The Soviet spearheads had swept through the rear supply and administrative services of the Sixth Army. Each little village across the steppe between Stalingrad and the Chir River housed some sort of repair shop, stable, supply troop, replacement center, or transport depot. Mechanics, bakers, clerks, farriers, photographers, and drivers were all cast adrift. Men going on leave, men returning from leave, officers just passing through all suddenly found themselves on their own. The Don River is one of the great rivers of Russia. It rises about 100 miles south of Moscow, flows south past Voronezh and then, near Novaya Kalitva, begins bending southeastward toward Stalingrad. About 60 miles northwest of Stalingrad the river bends south then southwest, passing about 40 miles west of Stalingrad at Kalach and eventually flowing into the Sea of Azov at Rostov. The area of Novaya Kalitva–Kalach–Rostov, the great bend of the Don, stretches 200 miles north to south and 200 miles east to west. The Chir River flows southward through the great bend of the Don about 100 miles west of Stalingrad, curves northeastward, then southeastward and flows into the Don about 65 miles southwest of Stalingrad. The German XVII Army Corps was taking up positions along the upper Chir with two German infantry divisions and pieces of several Romanian units. The remnants of the Romanian Third Army, with pieces of several divisions and the remnants of the German XLVIII Panzer Corps, was gathering along the lower Chir at its confluence with the Don. That was where something remarkable was happening. Responsible officers rounded up men on their own initiative and formed them into makeshift platoons, companies, and battalions. They recognized important tactical and strategic ground and undertook to hold it. They had no orders. They didn’t even know what was happening over the next hill. They just instinctively knew what to do and did it. Soon ad-hoc units with names like Group General Spang or Group Colonel Schmidt or Group Colonel Abraham were digging in along the Chir, the first natural defensive line west of the Don and west of Stalingrad. Surrounded by destroyed buildings, a German heavy mortar crew follows infantry during fighting in Stalingrad. Hitler refused to allow the Germans to give up the city once it was surrounded by the Russians. The Romanian Third Army was now Romanian in name only since the chief of staff of the German LVII Panzer Corps, Colonel Walter Wenck, had been sent to take charge of the army after it had been routed. Wenck, officially the chief of staff, started with literally nothing and was busily rounding up troops anywhere he could find them, in many cases using some creative recruiting methods. For instance, he had encountered a propaganda company that had been part of the Sixth Army rear services and had them put up tents with movie shows near several traffic junctions. Men who stopped by to take in the movies were rounded up, reequipped, and put in the line. When he found himself in need of transportation for his newly formed units, Wenck had his security team put up a sign reading “fuel issuing point,” and soon had all the trucks and staff cars he could use. South of the Don River in the Fourth Panzer Army/Romanian Fourth Army sector, the front was even more scarcely manned. The nearest Army Group A units were about 350 miles south of Stalingrad in the foothills of the Caucasus. About halfway between was the German 16th Motorized Division near Elista, and that was it. Remnants of Romanian cavalry troops were roaming the steppe, out of touch with headquarters, but nothing else—at all! The Luftwaffe had nowhere near enough cargo planes to fly in the minimum requirement of 500 tons per day to Stalingrad, so it had to utilize Heinkel He-111 bombers and other combat aircraft that were totally unsuitable for the mission. Whatever aircraft were used, the conditions at the airfields both inside and outside the pocket were primitive. The ground personnel were housed in improvised barracks at best, mud huts at worst. There were no hangars for the planes; all maintenance and freight handling had to be performed out in the open, exposed to blizzards and temperatures far below freezing. Manstein’s train arrived at Novocherkassk just after noon on November 26 and his new Army Group Don was declared operational the next day. The new army group included the German Sixth Army and the Romanian Third Army as well as the German Fourth Panzer Army and the Romanian Fourth Army, the latter two being grouped together as Army Group Hoth under Colonel General Hermann Hoth, commander of Fourth Panzer Army. The weather warmed just enough that the snow became rain and the roads became quagmires. The next day OKH (Oberkommando des Heeres, the German high command) informed Manstein of the reinforcements he would receive for the relief attack: LVII Panzer Corps with the 6th and 23rd Panzer Divisions and 15th Luftwaffe Field Division was to arrive at Kotelnikovo by December 3 for Fourth Panzer Army. Deployed in the Third Romanian Army sector and scheduled to be operational about December 5 would be a new formation known as Provisional Army Hollidt—an ad-hoc headquarters put together with scratch units and parts of the XVII Army Corps staff. Provisional Army Hollidt was headed by the former commander of XVII Army Corps, General Karl Hollidt, who would take command of the XVII on the upper Chir River and replace the headquarters of the Third Romanian Army on the lower Chir. It would consist of the 62nd, 294th, and 336th Infantry Divisions, as well as the XLVIII Panzer Corps with the 11th and 22nd Panzer Divisions, 3rd Mountain Division, and the 7th and 8th Luftwaffe Field Divisions. Manstein thought that these forces—four panzer divisions, four infantry/mountain divisions, and three Luftwaffe field divisions, if they were up to strength and arrived in good time—might just be sufficient to break through to the Sixth Army, even given the fact that the Luftwaffe divisions were only suitable for defense. On November 28, Manstein sent a long teletype message to Hitler in which he described his appreciation of the situation and his intentions in some detail. Manstein knew that the best he could hope for was to reach Sixth Army and help it to withdraw from Stalingrad and to regain firm contact with Army Group A as it withdrew from the Caucasus, and he said so. Two days later Hitler called Manstein in the middle of the night. “Mein Führer, put Army Group A under my command and give me operational freedom for both Army Groups!” Manstein shot back. “It’s a question of the possession of Baku, Field Marshal. Unless we get the Baku oil, the war is lost,” Hitler intoned. “If I can no longer get you the oil for your operations, Field Marshal, you will be unable to do anything!” Tanks, aircraft, trucks, everything depended on oil, he continued, in the manner of a lecture. Hitler didn’t react; he seemed to have stopped listening. On December 1, Manstein released his plan for the relief attack. It called for LVII Panzer Corps to strike northeast from Kotelnikovo across the steppe to Stalingrad and for XLVIII Panzer Corps to strike from its bridgehead over the Don River near Nizhniy Chirskaya, due east to the pocket. Although Nizhniy Chirskaya was about 30 miles closer to the pocket, Manstein knew that the Russians were aware of the bridgehead’s importance and were building up forces against it, so he hoped to gain some surprise by initiating his attack from farther south. When the LVII Panzer Corps advance came abreast of the bridgehead, XLVIII Panzer Corps would join the attack. He expected to begin the attack by December 8. Conditions in Stalingrad had been unbearable for a long time. Once cut off and isolated, the deprivation only increased. Half a million men had bludgeoned each other and the cityscape for months, with artillery and bombs obliterating city block after city block. A large portion of the pocket was outside the city proper on the steppe that surrounded Stalingrad, and conditions were no better there. Trees did not grow on the windswept steppe, so there was no firewood to gather. There were no prepared positions, so dugouts had to be blasted in the frozen earth with explosives. There were some burned-out and deserted tanks left over from earlier battles; these became firing positions and provided some shelter. Food quickly became scarce, forcing cooks to slaughter draught horses to feed the troops. There were constant Soviet probing attacks around the entire perimeter, so none of the German units could conserve ammunition; they were always under pressure. And it certainly didn’t help that during the first five days of the airlift the Luftwaffe managed to deliver an average of only 58.3 tons of supplies per day, slightly more than 10 percent of the minimum daily requirements. By the first week of December reinforcements began to trickle in. Provisional Army Hollidt received the 336th Infantry Division, transferred from Army Group B, which began filling in along the lower Chir, while the 7th Luftwaffe Field Division moved in to cover Morozovsk and its airfield. In a surprise move, General Zeitzler managed to drag another division, 17th Panzer, away from Army Group Center. The 17th left Orel for transit to Army Group Don on December 2 but was quickly hijacked by Hitler, who thought he detected an enemy buildup near the army group’s northern boundary and diverted the division there. The 11th Panzer Division arrived on the 7th, just in time to eliminate an enemy penetration of the lower Chir River line near Surovikino. In fact, the Soviets had just turned up the pressure along the entire lower Chir front with the Soviet Fifth Tank Army undertaking a number of attacks along the river line. The 11th Panzer spent the next week as a fire brigade, striking one penetration after another: Lissinski, Kalinovski, Oblivskaya, traveling by night and attacking by day. During the course of these actions, it destroyed well over 130 enemy tanks was worn down. Soviet General Andrei Yeremenko, beleaguered commander of the Stalingrad Front. The airfields at Morozovsk and Tatsinskaya, which were used for the airlift to Stalingrad, were located behind the Lower Chir; therefore, any penetration of the Chir threatened the supply effort and had to be eliminated. For this reason, it looked less and less likely that XLVIII Panzer Corps would be able to break free from the Chir front and participate in the relief attack; the entire attack would fall to General Kirchner’s LVII Panzer Corps. The 6th Panzer Division had arrived at Kotelnikovo in good time but had been forced to battle enemy units there ever since, just to gain hold of its starting positions. Panzer Regiment 201 of the 23rd Panzer Division had likewise arrived but needed all the time it could get to finish undergoing emergency rebuilding. Further, most of the division’s wheeled units had not yet arrived due to a thaw in the Caucasus that turned the roads there into a sea of mud. As for the 15th Luftwaffe Field Division, it was still forming up in the Salsk area. Manstein had no choice; he could not start the relief attack on December 8. Manstein was in a race with death, and he knew it. First, he had to watch his northern flank. He knew that any repeat of the Soviet Uranus-type attack on his tenuous northern flank could very quickly turn into a catastrophe for both Army Group Don and Army Group A to the south, but that didn’t seem imminent. Right now he had to maintain Sixth Army in Stalingrad via an airlift that had so far failed to meet the minimum requirements and at the same time build up a strong enough relief force to liberate the pocket, all before the Soviets could bring to bear enough force to eliminate the pocket and perhaps the army group as well. Fortunately for the Germans, Stalin had a similar problem. While Manstein had to free Sixth Army so as to have the troops to prevent Army Group Don and Army Group A from being cut off, Stalin had to eliminate Sixth Army to free up enough of his own troops to attack and cut off the German army groups. Finally, Manstein received a bit of good news amid the doom and gloom. The 6th Panzer Division had delivered a stunning victory! In a two-day running battle north of Kotelnikovo, the division virtually destroyed the Soviet IV Cavalry Corps; the 85th Cavalry Division was smashed, its commander killed, the 115th Cavalry Division decimated and its commander killed, and 56 tanks of 65th Tank Brigade destroyed. The corps commander escaped by swimming the river, but his entire staff was captured. The only significant group to escape was a troop mounted on camels, as they were the only ones able to freely negotiate the extensive marshlands in the area. There was also good news from the pocket. After a week of one attack after another without any apparent effect, the assaults were slackening. The brave defenders of Stalingrad had done an outstanding job parrying one thrust after another, eliminating one penetration after another, surrendering not one meter of ground. At LVII Panzer Corps in Kotelnikovo, the troops were ready and the ground had firmed up, thanks to a drop in temperature on the 11th. The 23rd Panzer, now with nearly 100 tanks, was on line and ready to go, and 6th Panzer, exulting in its recent victory, was champing at the bit. Still no 15th Luftwaffe Division, but the remnants of the Romanian 5th and 8th Cavalry Divisions, under command of German Colonel Helmut von Pannwitz, were ready to cover the corps’ open right flank. The terrain around Kotelnikovo and between there and Stalingrad was gently rolling steppe with virtually no vegetation except the ubiquitous steppe grass. What little there was in the way of bushes or small trees were only found in the many steep-cut ravines that were scattered throughout the area. Kotelnikovo is on the south bank of the southern branch of the Aksay River, and the LVII Panzer Corps held a small bridgehead on the north bank. The northern branch of the Aksay crossed the line of advance 28 miles to the north. The Myshkova River, 16 miles beyond the northern Aksay, also crossed the German line of advance. The distance from the Myshkova to the pocket was approximately 55 miles. At first light on December 12, the 6th Panzer Division’s 76th Artillery Regiment unleashed a storm of high explosives on the Soviet main strongpoint in the area of Gremyachi Station, on the rail line northeast of Kotelnikovo. After a few moments, while the panzergrenadiers fixed the enemy facing their bridgehead with strong assaults, the division’s Panzer Regiment 11 burst out of the bridgehead and advanced along the rail line toward Gremyachi Station in a deep wedge formation. At the same time, 23rd Panzer struck out northeasterly along both sides of the southern Aksay toward Pimen Cherni, 61/2 miles east of Gremyachi Station. At 9:50 am, with Pimen Cherni in hand, the 23rd continued its advance, attacking Nebykoff and Koschara. So rapid was the 6th Panzer’s advance that it overran the enemy artillery positions before they could either commence firing or displace out of danger. By mid-morning the tanks had overrun the hastily abandoned enemy headquarters, paralyzing the enemy’s control of operations. Once they had consolidated Gremyachi Station, they pivoted west and slashed into the Soviet troops flooding back from the Kotelnikovo bridgehead toward Verchne-Yablochniy. All afternoon 6th Panzer’s grenadiers approached Verchne-Yablochniy from the south in a widely echeloned formation, making it easy for troops there to see that the enemy was approaching. As they got within machine-gun range of the village, the Germans threw themselves to the ground and crept forward individually, from cover to cover, making several small probing attacks to keep the enemy’s attention. The tanks of Panzer Regiment 11, which had advanced independently of the grenadiers, had worked their way around the vast marshy area east of the village and were in position behind a low range of hills just north of the village. An hour before sunset, the panzers swept down into the village in a wide inverted wedge, hitting the surprised enemy in the rear. Colonel Walter von Hünersdorff led a battle group at Stalingrad, but was killed the following July at Kursk. The Soviets’ attempts to maneuver their few tanks and defensive guns into position against this new threat were completely in vain as they were quickly destroyed. The village burned brightly from end to end, and 10 Soviet T-34 tanks were reduced to burned-out hulks. The German left flank was secured. Meanwhile, the 23rd Panzer Division was securing the corps’ right flank east of the railroad. At 1:35 pm, the 23rd captured Nebykoff and 250 prisoners, and at 2:45 it occupied Koschara II, destroying all enemy there. Shortly before dark, the division reached its objective for the day near Chilekovo and made contact with the motorcycle battalion of the 6th Panzer Division on its left. Overnight the division consolidated the positions taken and reorganized for the continued attack. The German attack shocked the Soviets. 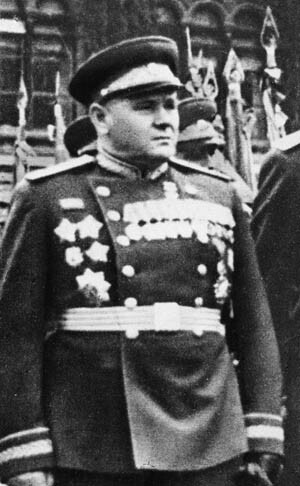 General Andrei Yeremenko, commander of the Soviet Stalingrad Front, feared that Hoth’s attack might threaten the rear of his 57th Army, which was holding the encirclement front south of Stalingrad. He warned Stalin that if this happened it might become possible for the Sixth Army to break out through the 57th and escape the pocket! Stalin was not happy; he told Yeremenko in no uncertain terms to hold on and promised to send the best that he had left, the 2nd Guards Army, which was just arriving in Vertyachi. That was fine, but the 57th Army needed something to hold the German attack now. Yeremenko withdrew the weakened IV Mechanized Corps and ordered it to Verchne-Kumskiy to block 6th Panzer and moved the XIII Tanks Corps to Aksay to block 23rd Panzer; it was all he could do. By 8 pm, after a short break, 6th Panzer’s tanks were on their way again; next target: the northern branch of the Aksay River, 14 miles to the north. Kampfgruppe (KG) Hünersdorff, composed of the panzer regiment plus a battalion of infantry and a battalion of artillery, as well as an antitank gun company and an engineer company, all led by the panzer regiment commander, Colonel Walther von Hünersdorff, advanced slowly. The ground was clear and gently undulating, and Hünersdorff expected few enemy troops in the area, but the night was pitch black, lit only by the stars. Kampfgruppe Hünersdorff reached the fog-shrouded valley of the Aksay as dawn was breaking on the 13th and began searching for a crossing point. A suitable ford was soon found at Salivskiy, where the pioneers began building a bridge and the panzergrenadiers established a bridgehead while the tanks continued north toward Verchne-Kumskiy, eight miles away. Pressure against 23rd Panzer that morning was mostly from the east at Koschara II while the enemy in front of the division seemed to be withdrawing. At 10:50 am, General Hoth, commander of the Fourth Panzer Army, arrived at the 23rd’s forward headquarters. An intercepted radio message indicated that the enemy would be attacking the eastern flank of the division that day, so Hoth ordered the division to assume a defensive posture and await the attack. Shortly after noon the expected attack began with Soviet units hitting simultaneously at Koschara, Koschara II, and Ternovy. Local troops and antitank units at those locations held up the enemy all afternoon while the panzer regiment hit the enemy’s armored probes, eliminating one after the other. This action secured the corps’ right flank, at least for the time being, but it tied down some of the division’s infantry holding those villages. As the 6th Panzer Division’s KG Hünersdorff crested the ridge about two miles south of Verchne-Kumskiy, scouts reported no enemy in town, nor on Hill 140 to the west. Then suddenly the radio blared: “Enemy tanks!” Scouts to the east reported a heavy concentration of Red Army tanks in a broad depression south of Hill 147. Apparently the Soviets intended to block the Germans’ access to Verchne-Kumskiy and were unaware that KG Hünersdorff was already there. Hünersdorff detailed Major Bäke’s II Battalion to deal with the enemy tanks while the remainder of the kampfgruppe proceeded into Verchne-Kumskiy. As the Soviet tanks began to climb the gradual slope of the depression, the Germans opened fire. The first 12 tanks were blasted in order; those following retreated back into the depression, followed closely by the German tanks which proceeded to surround the depression. What followed was an unbelievably one-sided, concentric “battle” between Soviet tanks in the cauldron and German tanks lining the rim. An entire Soviet tank brigade—more than 70 tanks—was completely destroyed in less than an hour with not a single German loss. Thus began an incredible day of tank combat in and around Verchne-Kumskiy, which saw KG Hünersdorff engage and defeat three Soviet tank brigades individually, one after the other, as they arrived on the scene. 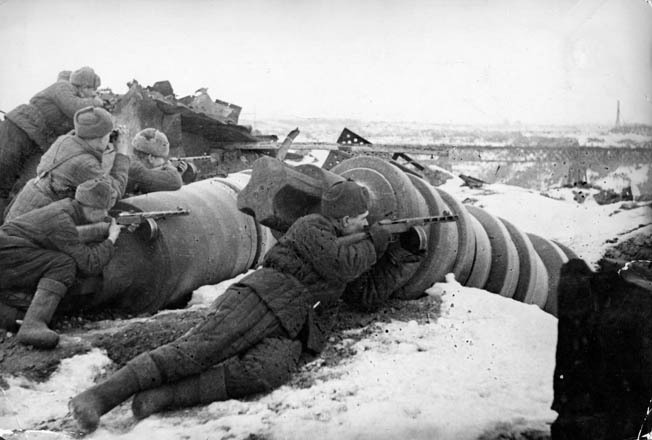 Soviet troops use the rubble of Stalingrad as cover while firing on German positions. With the Luftwaffe unable to transport more than a fraction of the needed supplies to the Germans in Stalingrad, the situation was nearly unbearable. Meanwhile, on the Chir front the 11th Panzer Division was exhausted after several days of moving and attacking; it was obvious that it would not be strong enough for the attack on the pocket. But Manstein came up with another option: move 17th Panzer from its reserve position into the Don bridgehead at Nishne-Chirskaya so that it could take 11th Panzer’s place and attack toward the pocket when the time came. Manstein made clear to Hitler that the new enemy forces being thrown in against Hoth’s relief attack made it questionable whether it could reach Stalingrad, and the only option they had was to use 17th Panzer to enhance the attack’s chances. After all, of what use was the division sitting in reserve when the front was in flames? To everyone’s surprise Hitler finally recognized his folly and released 17th Panzer for the relief attack. It would move into the Don bridgehead at Nishne-Chirskaya and attack from there when LVII Panzer Corps’ attack came abreast of it. Back at Verchne-Kumskiy, the remainder of KG Hünersdorff had rolled into town just in time to intercept another Soviet armored unit that was rushing to the aid of the tank brigade that was being obliterated south of Hill 147. Panzers of Major Lowe’s I Battalion confronted the new enemy armor north of town and destroyed three tanks straight off the march. As German infantry arrived and set up defenses on the northern edge of town, the panzers slowly withdrew and turned the defense over to the grenadiers. The din coming from the battle south of Hill 147 was just starting to fade when a third enemy tank brigade struck on the east side of town, just north of Hill 147. Major Lowe was trying to gather his forces to meet this new threat when he received a radio call from Major Bäke: “Hold on, we’re coming!” The men in town looked south toward Hill 147 and could see only one thing—victory! Four wedges of German tanks simultaneously crested the hill and raced at full speed down the slope toward the enemy. Colonel von Hünersdorff had Major Bäke spread his formation to his right to out-flank and encircle this new threat to the east while Major Lowe, having destroyed most of the enemy tanks on the north, was to hold in town and send some of his tanks to encircle the new enemy to the north. The Soviet commander tried to spread his tanks out and bend back his flanks to prevent their being turned, but he could not. Heavy fire from the panzers on the hill and in town pounded his every move. The first steel wedges reached his southern flank and pressed in, but still the Soviets resisted tenaciously. Finally, facing annihilation, the Soviet commander ordered retreat. Many of the Soviet tanks had entered the killing ground east of Verchne-Kumskiy via a sunken road to the northeast; the survivors quickly withdrew the same way. But only a portion of the Soviet tank brigade escaped, leaving more than half its number on the field. Dashing through snow and sub-freezing temperatures, Soviet infantry rides into battle atop tanks on December 16, 1942, during Operation Little Saturn, an all-out attempt to halt Manstein’s advance on Stalingrad. And so it went the rest of the day—a dazzling display of the advantage gained by determined men fighting on inside lines on a mobile battlefield. Three times numerically similar enemy groups rushed in from different directions to rescue their comrades and were destroyed. Dashing straight through Verchne-Kumskiy from one side to the other and back again, KG Hünersdorff defeated, one at a time, a force three times its size. Just before sunset, KG Hünersdorff, low on fuel and ammunition, began to withdraw from Verchne-Kumskiy to the bridgehead at Salivskiy, which was under pressure. The 23rd Panzer Division had spent the day fighting off the growing enemy on the right flank and had not reached the northern Aksay yet. If the Soviets could recapture Salivskiy, Colonel von Hünersdorff and his troops would be isolated north of the river in a perilous situation. Furthermore, the object of the day’s combat was not to take and hold ground; it was to attrite a numerically superior enemy—and that was certainly accomplished. KG Hünersdorff arrived back at the northern bridgehead just as the third attack of the day was about to overwhelm its defenders. In the fading light, the grenadiers in Salivskiy thought the approaching tanks were the enemy and prepared for the worst. As the German tanks smashed into the rear of the Soviet attackers a cheer went up, and the enemy began to flee. On December 14, Panzer Regiment 201 regained forward momentum for 23rd Panzer, capturing Samokhin before noon and approaching Kruglyakoff on the northern Aksay by mid-afternoon. In a bold move, a company of tanks turned south from the Kruglyakoff advance and, in an abrupt surprise, captured the railroad bridge over the Aksay intact. By 3:30 pm, the panzer regiment had consolidated its hold on Kruglyakoff and the railroad bridge. Overnight, German engineers replaced the Soviet bridge demolitions with their own and fended off several infiltration attempts by enemy sappers. The most important development on the 15th was on the Chir front, where the long-held and potentially useful bridgehead over the Don River near Nishne-Chirskaya was lost. The fresh Soviet VII Tank Corps had attacked the bridgehead on the 14th and took only a day to make the German position there untenable. The Germans were forced back and blew up the bridge as they withdrew. Without the bridgehead, 17th Panzer could not attack toward Stalingrad and was therefore diverted south to join the LVII Panzer Corps attack on the Aksay River as soon as possible. The 17th began crossing the Don at Tsimlyanskaya that same afternoon. The Soviet leadership had initially pulled units from the encirclement front to oppose the LVII Panzer Corps attack; it followed that up by committing a strong new army—2nd Guards Army—to confront the threat. Now it took the radical step of reaiming its climactic attack of the campaign—Operation Saturn—designed to strike once Stalingrad was secured and intended to sweep across the Don bend from the north all the way to Rostov, cutting off whatever was left of Army Group Don and the entire Army Group A in the Caucasus. Now, Stalin ordered a change. Rather than striking southwest toward Rostov, 2nd Guards Army would strike southeast and hit the rear of Hoth’s relief attack instead. The aptly renamed Operation Little Saturn was launched early on December 16 from the northern reaches of the Don bend on both sides of Boguchar when the Soviet 6th Army, as well as the 2nd and 3rd Guards Armies, struck Provisional Army Hollidt and the Italian Eighth Army of Army Group B. Even after their tank brigades joined the assault about noon, the Soviets made little headway on that first day. Early on the 17th the Soviets facing LVII Panzer Corps became more active as reports began rolling in at dawn: 20 panzers at Samokhin, tanks with infantry at Shutov I and Kamenka, and some 40 tanks with infantry at Shestakov. Those tanks crossed the frozen Aksay and entered Shestakov about halfway between the 23rd’s bridgehead at Kruglyakoff and 6th Panzer’s bridgehead at Salivskiy. Grenadiers of a panzer division trudge through the snow near Stalingrad, December 1942. The weather played a significant role in the outcome of the battle. For the first time Stuka dive bombers assisted 23rd Panzer and brought palpable relief with their precision attacks on enemy concentrations. During the day the enemy pressure increased markedly on the eastern flank, north of the Aksay. The 6th Panzer Division was also well supported by Stukas on the 17th when it undertook an operation to clear the hills south of Verchne-Kumskiy that the enemy had reoccupied. Just as the sun began to rise over the frozen steppe, German engineers and grenadiers, thoroughly camouflaged, began to infiltrate through the tall grass toward their first objective, a Soviet artillery observation post (OP) on Hill 140. At 8 am, with the grenadiers in position, the artillery regiment opened fire on the OP with all tubes. A few moments later, white flares signaled that the objective had been captured. The artillery shifted its fire, and Stukas appeared on the horizon flying in a majestic wedge formation. The first wave delivered its load of high explosives and was flying off as the second wave approached in a high altitude “V” above the horizon, then a third wave, and a fourth. Enemy artillery fell silent. Where a moment before had stood a gun, now only smoke and a deep hole remained. When advancing grenadiers encountered bunkers, German flamethrower teams burned the inhabitants out with a loud whoosh. By early afternoon, a two-mile breach had been forged through the Soviet position; it was time for 6th Panzer’s main body to surge through and retake Verchne-Kumskiy. But reconnaissance revealed that the town was held by strong enemy forces with numerous antitank positions and dug-in tanks. General Raus, commander of the 6th, decided to postpone the attack until after dark, in the meantime softening the enemy up with artillery and dive bombers. After sunset, the assault detachments crept up to the edge of the village completely unseen. By the light of several burning buildings they could see the Soviet troops as they took a meal, totally unconcerned. The Germans burst into the town, and grenadiers rounded up the stunned troops while engineer antitank teams went after prelocated enemy tanks. The battle was over quickly, and German artillery targeted the few tanks that escaped. Not only did the Germans suffer minimal casualties, they captured several antitank guns and a great deal of heavy equipment. The 17th Panzer Division finally made it to the corps sector on the 17th. Advancing from Verchne-Yablochniy against weak enemy resistance, it captured a bridgehead over the northern Aksay at Generalovskiy, 12 miles west of Salivskiy, by mid-afternoon. Late on the 17th, the first units of Soviet Lt. Gen. Rodion Malinovsky’s 2nd Guards Army began arriving at the Myshkova sector. Two rifle divisions of the 1st Guards Rifle Corps arrived that evening and deployed straight off the march. The remainder of the army, the 2nd Guards Mechanized Corps and 13th Guards Rifle Corps, arrived continually over the next two days. General Fridolin von Senger und Etterlin hustled his 17th Panzer Division forward into the bridgehead at Generalovskiy overnight in order to strike northward at first light on the 18th. By mid-morning it approached the enemy strongpoint at the collective farm “8th of March” over icy ground. The collective was about seven miles west of Verchne-Kumskiy and served as the western end of the defensive line the Soviets had formed in the hills north of the Aksay River. 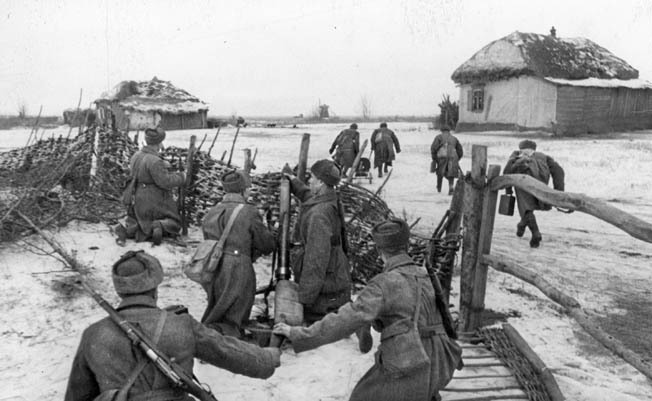 Soviet troops watch from behind a fence as their comrades rush a German-held farmhouse outside Stalingrad during the German rescue attempt, December 1942. While the artillery deployed, the tank detachment outflanked the farm to the west and Panzergrenadier Regiment 40 assaulted the building complex. As a company of tanks turned into the rear of the farm complex, the rest turned to meet a line of enemy tanks approaching from the north. In an hour-long swirling battle, 21 enemy tanks were destroyed and 150 prisoners were taken. North of Verchne-Kumskiy, the 6th Panzer Division was preparing to strike northward when news arrived that 23rd Panzer was in serious difficulty and required 6th Panzer’s assistance as soon as possible. Hünersdorff pulled his tanks back into Verchne-Kumskiy and turned east toward Kruglyakoff; pursuit of the broken enemy northward would have to be turned over to the 17th Panzer Division. Strong Soviet units from the Shutov I and Kamenka areas were putting heavy pressure on the 23rd Panzer’s bridgehead at Kruglyakoff. Stukas had relieved some of the pressure, but the enemy kept bringing up more troops. As KG Hünersdorff approached Kruglyakoff, the men could see the enemy swarming over both the railroad and road bridges into the town. Without hesitation, the tanks remaining on the north side of the river swung out along the enemy’s right flank and opened fire. The enemy, fearful of being cut off, fled northeastward along the railroad tracks from whence they had come. The 23rd regained both bridges and its forward positions and reinforced them as much as possible. In the meantime, 17th Panzer’s advance detachment, built around Panzer Regiment 39, had circled around Verchne-Kumskiy to the west and left Panzergrenadier Regiment 63 to clean up and secure the town. 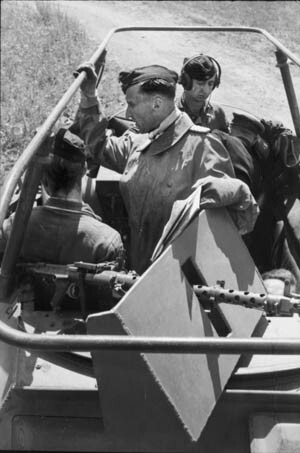 General von Senger und Etterlin led the panzer group northward, and by 1 pm it reached Nishne-Kumskiy on the Myshkova River and surrounded it. As soon as Kruglyakoff had been secured, General Raus ordered Hünersdorff and his tanks, which at that point had suffered no casualties, to turn north and push on through the night toward the Myshkova River at Vasilevka, 16 miles east of Nizhne-Kumskiy. Brushing aside the weak resistance that it encountered en route, the KG approached Vasilevka at dawn on the 19th and in a daring surprise move captured the bridge over the Myshkova in the center of town. The spearheads of two German panzer divisions were now at the Myshkova River, where they expected the Sixth Army breakout to meet them. But the hard fighting had left both divisions severely weakened. Both had been forced to leave units behind to guard their flanks and supply line, and the two divisions together fielded barely 50 tanks. On the army group’s northern flank, the situation of the neighboring Italian Eighth Army of Army Group B had deteriorated on the second day of the Little Saturn attack. Then, on the 18th the Italians completely disintegrated, exposing the entire left wing of Provisional Army Hollidt. This meant that three Soviet armies were poised to charge southeast, 20-30 miles behind Provisional Army Hollidt’s front lines on the Chir River and smash straight into the rear of the LVII Panzer Corps’ attack on the Myshkova. The army group could be encircled or destroyed. Manstein saw the writing on the wall; although Hoth’s attack was only 55 miles from the pocket, it had slowed to a standstill and, considering the forces that the enemy was known to be bringing to bear in front of it, it was not likely to revive. Furthermore, the airlift was simply not delivering enough to sustain Sixth Army. Additionally, Manstein’s northern wing was beginning to crumble under the weight of Little Saturn. Something had to be done, and soon. The last remaining alternative was to have Paulus’s Sixth Army break out and reach Hoth’s spearhead. Manstein was certain that if Sixth Army began to break out to meet Fourth Panzer Army, it would have to be an all-out proposition, an attack with all its strength in front to ensure a successful breakout; Sixth Army did not have the luxury of being able to simply extend its front and link up. Manstein’s intention was to have Sixth Army break out in two phases. First, with the code words Winter Storm, Sixth Army would attack southwestward to link up with LVII Panzer Corps while maintaining the entire front around Stalingrad. Phase Two, the code word Thunderclap meant Paulus would begin a phased withdrawal from Stalingrad. Manstein believed Hitler would agree to Winter Storm because it was the only way to get a supply convoy through. He also knew that Hitler would immediately countermand Thunderclap if it was issued too early. He hoped to present Hitler with a fait accompli because he expected that once Winter Storm was underway and the enemy realized what was happening, they would immediately attack—which would make the immediate execution of Thunderclap imperative because the front would certainly begin to collapse. It had to be done—Hitler would have no choice but to go along. At dawn on the 19th, Manstein sent his intelligence chief, Major Hans Eismann, into the pocket to explain his plan to Paulus. Meanwhile, on the Myshkova the 6th Panzer Division, in bitter hand-to-hand fighting, managed to forge a small bridgehead on the northern bank at Vasilevka on the 19th, but massive enemy forces surrounded it, preventing any breakout. Farther west on the river at Nishne-Kumskiy, 17th Panzer tried to move east along the southern bank of the river toward Gromoslavka, but Soviet positions on the dominant heights on the northern bank prevented any movement in that area. The 23rd Panzer Division was still south of the Myshkova trying to cover the LVII Panzer Corps’ lengthening right flank. Late that afternoon Manstein sent an urgent message to Hitler. He told the Führer that he doubted that the relief attack by LVII Panzer Corps would be able to reach the pocket. It was exhausted while its opposition was becoming stronger each day. But the major factor at the moment was that the left flank of the army group was in serious danger of collapse. The only solution, he said, would be for Sixth Army to attack southwestward toward a linkup with LVII Panzer Corps while simultaneously pulling back its northern and eastern fronts; there was no longer time for anything else. At 5:50 pm on the 19th, before he had received a reply from Hitler, Manstein contacted Paulus over a new high-frequency radio link that had just been installed. Paulus explained the various scenarios that Eismann had described and said that he now felt that the only viable alternative was complete withdrawal from Stalingrad. Manstein asked how soon Sixth Army could be ready to break out and how much food and fuel it needed. Paulus replied it could be ready in three to four days and would need reduced rations for about 10 days and 11/2 times the normal fuel rate. Based on this conversation, Manstein immediately ordered Winter Storm and said that Thunderclap might follow soon thereafter, depending on circumstances. There it was. Operation Winter Storm had been ordered, to commence in three to four days. The anxious wait began. In the Provisional Army Hollidt area, the lower Chir front was mostly holding, but the Soviet 5th Tank Army was giving the XLVIII Panzer Corps all it could handle. Hollidt was desperately trying to form a north-facing front between the upper Chir and Millerovo, 75 miles to the west, but Soviet tank formations were surging southward almost unopposed. 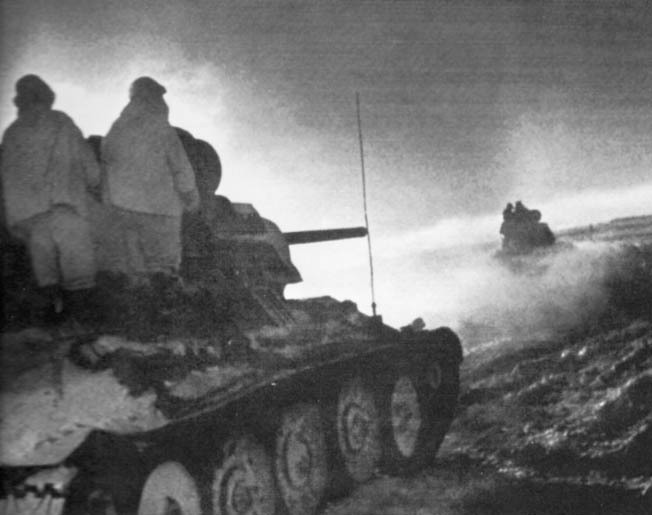 On the LVII Panzer Corps front at the Myshkova, the Soviet 2nd Guards Army completed its deployment during the evening of December 21 and prepared to attack the next morning. There were now 191/2 Soviet divisions with 149,000 men and more than 600 tanks deployed against the LVII Panzer Corps, which now had fewer than 85 tanks on hand. The only glimmer of good news for the Germans was from the airlift. On December 20, the airlift delivered 291 tons, the most it had delivered in one day. Unfortunately, that was only 58 percent of the minimum daily requirement, and it remained the most the airlift would deliver on any one day through the rest of the siege. By December 23, the Soviet XVII Tank Corps and XVIII Tank Corps held a tight ring around Millerovo in the Provisional Army Hollidt sector, and the way to Kamensk, on the Donets River 44 miles to the south, was wide open. The XXV Tank Corps and 1st Guards Mechanized Corps were closing in on Morozovsk, and XXIV Tank Corps was about to burst into Tatsinskaya. A graveyard of German, tanks, guns, and personnel litter a snowy landscape outside Stalingrad, December 1942. Despite near-superhuman efforts, Manstein’s rescue force was unable to free Paulus’s trapped Sixth Army. Frustrated, Manstein felt the last chance to rescue Sixth Army slipping away but could wait no longer; he had to act to save his army group, not to mention Army Group A in the Caucasus. He called General Hollidt and told him to send the 11th Panzer Division west to hold the airfield at Tatsinskaya, then called Hoth and told him to send one of his panzer divisions to the lower Chir front to take over for 11th Panzer there; Hoth ordered 6th Panzer to the lower Chir right away. The attack to relieve Stalingrad was over—at least temporarily. Manstein also ordered Hoth to maintain the LVII Panzer Corps’ bridgehead over the northern Aksay in order to resume the relief attack as soon as possible, but whether it could be revived remained to be seen. Manstein then contacted Paulus. Paulus told him that they would execute Thunderclap if there was no other alternative, but to do so would require 1,000 cubic meters of fuel. One thousand cubic meters was equal to 1,000 tons. That would take three to four days of relief flights at best—highly improbable. The 11th Panzer Division recaptured the airfield at Tatsinskaya on the 29th, and the 6th Panzer Division maintained Provisional Army Hollidt’s hold on the lower Chir. But in three days the LVII Panzer Corps was pushed back to its starting line at Kotelnikovo and then, by the end of the month, all the way back to the Little Kuberle River at Zimovniki. Operations to relieve Stalingrad were over. Operations to save the army group were just beginning. In the end, both Manstein and Paulus refused to go against Hitler’s wishes by evacuating Stalingrad, and both men used the fuel situation as an excuse not to act. Perhaps, if they had had any notion at all that in 10 years only some two percent of the enlisted men that went into captivity at Stalingrad would be alive to return to Germany, they might have acted differently. Tags Allies, Axis, Eastern Front, Erich von Manstein, Friedrich Paulus, general Hermann Hoth, German Sixth Army, Hermann Göring, Nazi Germany, oberkommando des heeres (okh), Operation Little Saturn, Operation Uranus, Panzer Army, Panzer Corps, Red Army, Romania, Rostov, Sevastopol, Soviet Union, Stalingrad.